So you’re getting the band back together – the college crew, the old school ties, or just family and friends – or you’ve been tasked with organising a stag or hen do, and you’ve decided to rent a party house. Good decision. Renting a party house trumps staying in hotels every time. You get to choose your own rooms. You set your own itinerary. You get sociable spaces where you can all be together (and spaces to be apart). And you get to choose your own guests. There’s also a fabulous choice of locations. Rent a weekend party house from us and you’ll be looking at amazing coast or country settings in places like Cornwall, Devon, Brighton, The Cotswolds, The Lakes and rural Scotland. Once you’ve chosen your self-catering party house, don’t think you need to be slaving over a hot Aga all the time, either. With many of our houses, you can share the cost of high-quality chefs for a one-off celebration or a fully catered break. Party houses also offer other opportunities that you simply don’t get with hotels. Like booking in-house entertainment. Maybe a chocolate party, a poker evening, a little pampering or even archery or zorbing out on the lawns. But party houses are not all made the same. So specialised is the market that you can rent houses specifically designed for all types of celebration – for birthdays with a zero on the end, hen parties, stag parties or wedding anniversaries. So, what to look for in a party house? Let’s start with location. If you’re all outdoorsy types and keen for some adrenaline-fuelled action, you’ll want a coast or country setting. Maybe Devon or Cornwall for surfing, kitesurfing, coasteering or open-water kayaking. Or the Lake District or the Cotswolds for walking, quad-biking, high ropes or paintballing. How about Halula Beach House or Edge 17? City slickers? How about Liverpool, Brighton or Bath? Rent a party house close to the bright lights and you’ll enjoy all the amenities of the house itself plus the party playground on your doorstep. Consider Dukes Pad in Liverpool or Victoria House in Manchester. Having settled on your perfect location, you’ll now want to choose the property that will make or break your celebration. Let’s look at a few options available right here. At Anfield House in Liverpool, there’s a serious football thing going on. There’s a golden Sky package for big games, endless food and beer, and even the chance to get your hands on football and racing tickets. 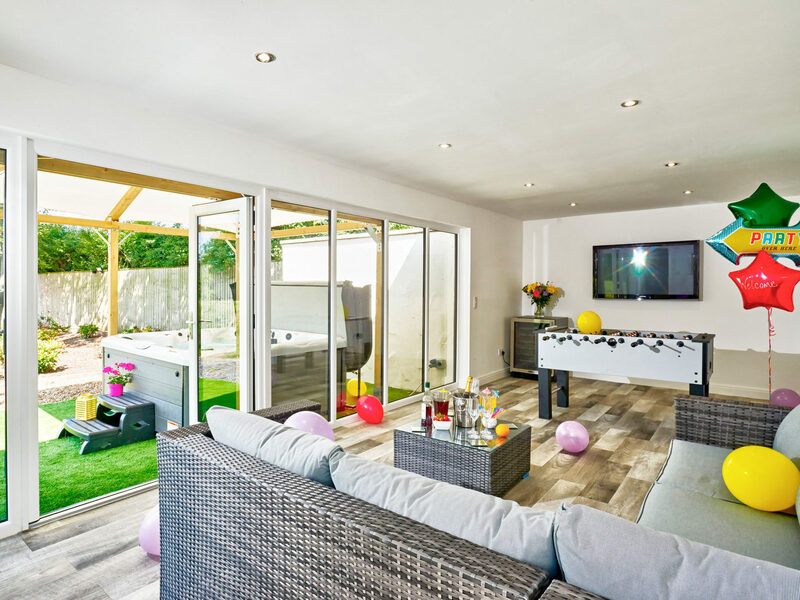 If it’s a hen celebration you’re after, Keepers near Blackpool promises an easy luxury laced with goodies such as an eight-person hot tub and games room. Book a beautician or a little pampering and call the weekend a roaring success. Then there’s Hill House in the Cotswolds, offering a heated pool, hot tub and tennis court. Not to mention the games room, acres of gardens and short walk to a good gastro-pub. Or how about Skyline Apartment, sitting high and handsome above city-centre Manchester, just yards from the bars, bistros and beat of the city? Drink and dine on the terrace then watch the sunset from the bubbling hot tub. So, what sort of features should you look for when you rent a party house? You might want sheer size. If your party numbers 20 or more, we’ve got the places and spaces for you. Loaded with beds, bathrooms and big kitchens, Dukes Pad in Liverpool sleeps an incredible 41. Still in Liverpool, Delphi Apartments, a series of four linked apartments, sleep a similar number. Northridge Hall and Cottage in Leeds sleeps 26, Edge 17, close to Newquay’s beaches, is England’s answer to Ibiza and will accommodate 23, and Severn Bank House will take 30 on the banks of the River Severn. If it’s a more-intimate affair you’re after, try The Cartshed in Suffolk. Sleeping eight, this has the atmosphere of a big-game reserve. Great for hunting down a more-chilled hen or stag do. Waterfall House sleeps 12 on Dartmoor. And Beachfront House is just a sprint from the sand in West Sussex for a dozen of your nearest and dearest. If it’s interesting features you’re after, a mere hot tub might be setting the bar a little low. So how about Cheshire’s Nova Spa? You won’t even need to head towards Chester’s bars, boutiques and bistros to have fun. Dive into the heated pool, get toasty in the Jacuzzi and sauna, take a tipple at the bar, catch a movie in the cinema room, hit the gym, get pampered or play arcade classics. Croft House in Devon offers a ‘celebration room’ in its cellar. The Cotswolds’ Hill House has a heated outdoor pool and its own tennis court. In Warwickshire, Elephant and Castle comes with its own bar equipped with wireless speakers. But it might be Cornwall’s Polpier that takes the biscuit. Heated outdoor pool? Tick. Tennis court? Tick. Woodburner? Tick. Pool table? Tick? Dance hall complete with DJ booth and disco ball? Oh yes. There’s a similar arrangement at Norfolk’s Carrington House, home to an underground soundproof cellar complete with DJ decks, dance floor, karaoke machine, six-foot cinema screen and dressing-up room. So you’ve found the perfect house: now it’s time for some in-house entertainment. Part of the fun of any holiday is an evening in with the boys or girls, a full glass and a roaring fire. If you can dream it, you can probably do it. In pretty much all of our houses, high-class catering is an option. Call up our chefs and don’t worry about the washing-up. Then there’s cocktail-making lessons or maybe hiring a beautician? How about turning the house into your own spa? My Personal Sanctuary offers a mobile massage and beauty service that’s organic and truly indulgent. Or what about a casino experience? Fret not. Expertise is not required. With a little tuition, you’ll soon pick up the basics of blackjack, poker and roulette. So, there we have it. Your guide to party-perfect pads. All that remains now is to check out some outstanding party palaces.